Evergreen’s Education Tipping Point: Women Are in the Majority! If you’ve ridden with the Crank Sisters or participates in any of Evergreen’s women-only classes, you notice one thing: women are dominating the sport. Evergreen/Microsoft Event Raises over $4,000! A huge thank you to the folks at Microsoft who attended Evergreen’s GIVE fundraising on October 4th. Attendees raised over $4,000 for local trails and bought 10 new members into our statewide community. 7th Annual Take a Kid Mountain Biking Day: Epic Riding & Record Bike Give-Aways! One of Evergreen’s favorite events—Take a Kid Mountain Biking Day—continues to be a huge success thanks to our members and sponsors! Our success reflects our volunteers' dedication! Each year we are lucky enough to have thousands of hours of volunteer support from community members statewide. As an organization built by volunteers, we take great pride in our impact. You're Invited to our Community Appreciation! 2017 was a big year here at Evergreen! We hosted more classes, trail openings, and work parties than ever before. And if you had a part in supporting the Evergreen community you're invited to our combined Volunteer Appreciation Party and Membership Meeting—which we are calling our Community Appreciation Party! New Olallie Trail Opening on Saturday, October 28th 9.2-miles of non-motorized, multiple-use mountain biking trail is officially open in Olallie State Park! Decades in the making and requiring the coordination of several partners, the resulting trail adds yet another opportunity for outdoor enthusiasts to enjoy public land in the North Bend area. Record-Breaking Memberships - Thanks to You! It’s true—your help in the last 3 weeks brought in record members; Evergreen’s total membership now stands at 3,721! By talking to friends, forwarding emails, and sharing posts, you helped raised $33,116 for your trails and bring 670 members into the community—in just 20 days! Take A Kid Mountain Biking on Oct. 7 @ Duthie! Ring in the fall ride season with family fun at our 7th Take a Kid Mountain Biking Day Festival on October 7 (10am-3pm) at Duthie Hill Park in Issaquah--and it’s all FREE! Growing each year, Take a Kid is a great chance for the little rider in your life to learn some skills or just have fun. And as always, there’s a free BBQ lunch provided by Gregg’s Cycle! From toddlers to teens, there’ll be something for everyone. The first 5.6 (eventually 8.7!) 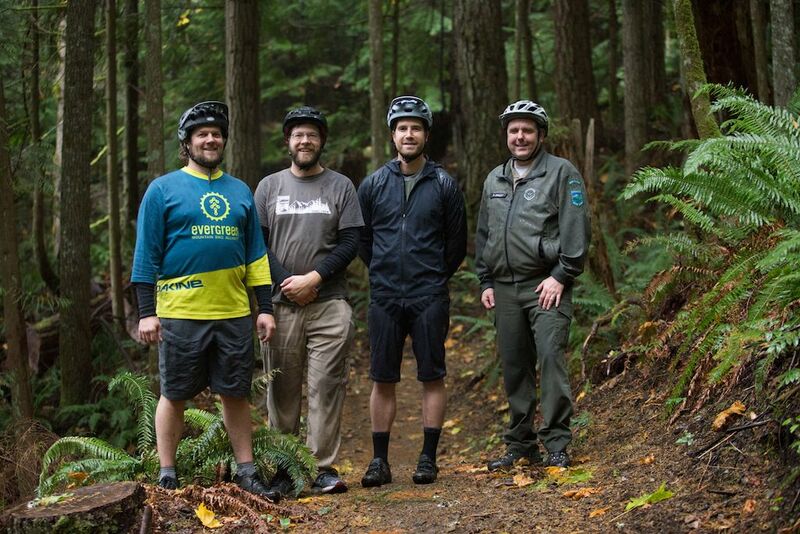 miles of multiple-use mountain biking trail opens TOMORROW at Olallie State Park, managed by the Washington State Parks & Recreation Commission. This new epic trail project results from the Olallie Area Mountain Bike Trail Study, which began way back in 2002! YOU are invited to enjoy the first 5.6 miles (11-mile out and back!) of trail. The remaining segment of trail should be completed by late September 2017.